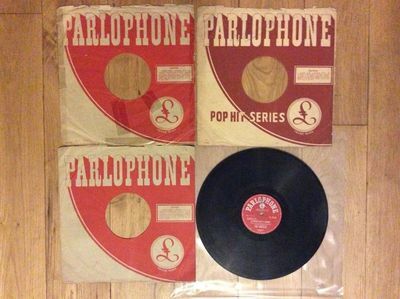 Here we have a rare Indian release Beatles 78rpm. I would grade the record as fair condition visually, lots of scratches and dulling. Both record labels have writing on labels, b-side a bit less than a-side. Play tested - No skips or jumps, expected background noise but music loud and clear. 3 company sleeves, one has some splitting at bottom but otherwise good, the darker red one has major splitting, the other red one has major tape repair. I am happy to package to specification, but otherwise will pack sandwiched between cardboard inserts in strong cruciform mailer, wrapped in additional bubble wrap. See my other rare 78 for sale.